The recent changes at Digg have been seen by some as anti-popularity-contest. Some diggers are finding it takes a lot more votes for stories they submit to become popular, and, at least to me, it appears the ratio of top-digger to everyone-else content on the homepage has gone down dramatically. With search engines it has been helpful to name certain algorithmic changes made by Google; Florida, Bourbon, etc. 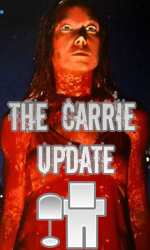 I propose that we name this recent change “Carrie” after the movie. Top diggers are the like the popular kids, the ones who are successful and get the attention of adoring masses. Carrie on the other hand, was different, didn’t quite fit in very well. But her day came on prom night and the cool people paid. I’d consider it a sort of an anti-prom-king/queen, revenge of the underdog reference. What do you think — got a better name?